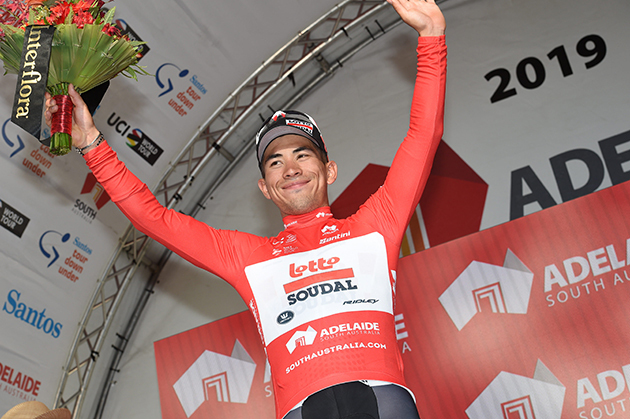 The race: Here's the report from winner Caleb Ewan's Lotto-Soudal team. 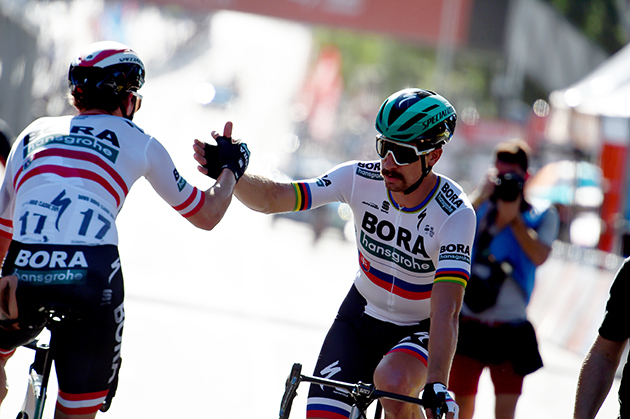 2 SAGAN, Peter (BORA-hansgrohe) s.t. 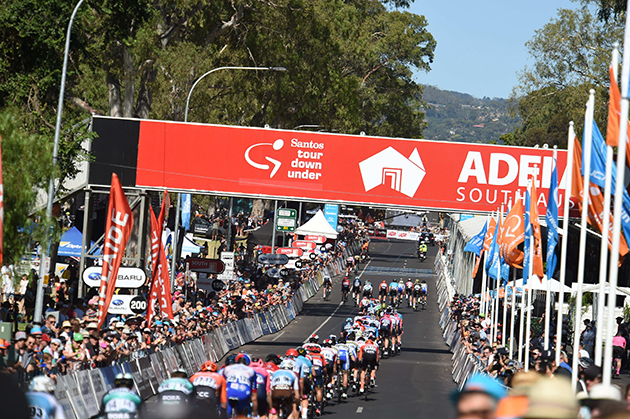 3 EDMONDSON, Alexander (Mitchelton-SCOTT) s.t. 8 SANCHEZ, Luis León (Astana Pro Team) s.t. 9 HALLER, Marco (Team Katusha Alpecin) s.t. 10 VENTOSO, Francisco (CCC Team) s.t. 11 BALLERINI, Davide (Astana Pro Team) s.t. 12 HONORE, Mikkel (Deceuninck-Quick-Step) s.t. 14 VAN BAARLE, Dylan (Team Sky) s.t. 15 MAS, Lluis (Movistar Team) s.t. 16 WALSCHEID, Max (Team Sunweb) s.t. 17 POGCAR, Tadej (UAE Team Emirates) s.t. 18 WOODS, Michael (EF Education First) s.t. 19 CHEVRIER, Clement (Ag2R La Mondiale) s.t. 20 PERNSTEINER, Hermann (Bahrain Merida) s.t. 21 HOELGAARD, Daniel (Equipe Groupama-FDJ) s.t. 25 BAK, Lars (Dimension Data) s.t. 26 ULISSI, Diego (UAE Team Emirates) s.t. 27 PHILIPSEN, Jasper (UAE Team Emirates) s.t. 28 BOARO, Manuele (Astana Pro Team) s.t. 29 DUPONT, Hubert (Ag2R La Mondiale) s.t. 30 GUERRERO, Ruben (Team Katusha Alpecin) s.t. 31 HAGEN, Carl Frederik (Lotto Soudal) s.t. 32 OWSIAN, Lukasz (CCC Team) s.t. 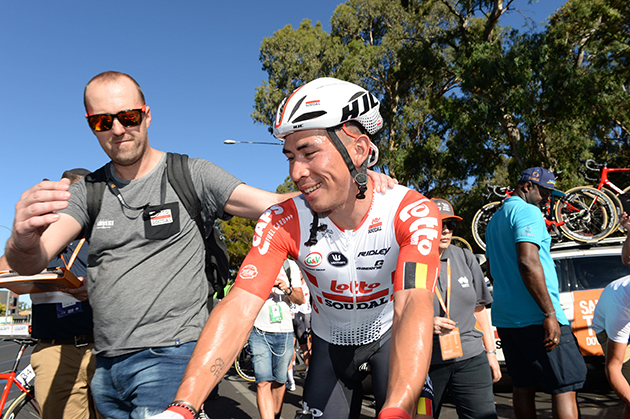 33 KANTER, Max (Team Sunweb) s.t. 35 HALVORSEN, Kristoffer (Team Sky) s.t. 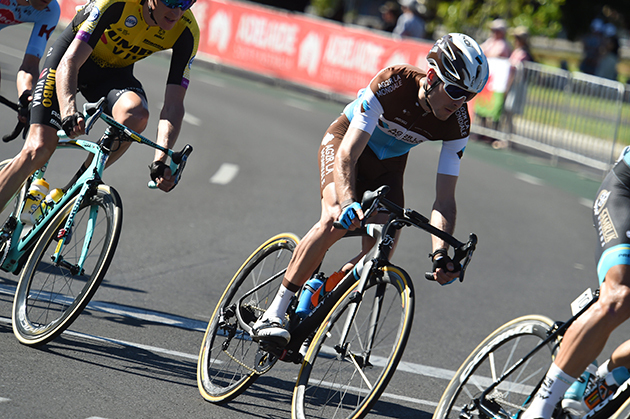 36 BAGDONAS, Gediminas (Ag2R La Mondiale) s.t. 38 HANSEN, Adam (Lotto Soudal) s.t. 39 VALLS, Rafael (Movistar Team) s.t. 40 FERNANDEZ, Ruben (Movistar Team) s.t. 41 POLANC, Jan (UAE Team Emirates) s.t. 42 DE KORT, Koen (Trek-Segafredo) s.t. 43 ARASHIRO, Yukiya (Bahrain Merida) s.t. 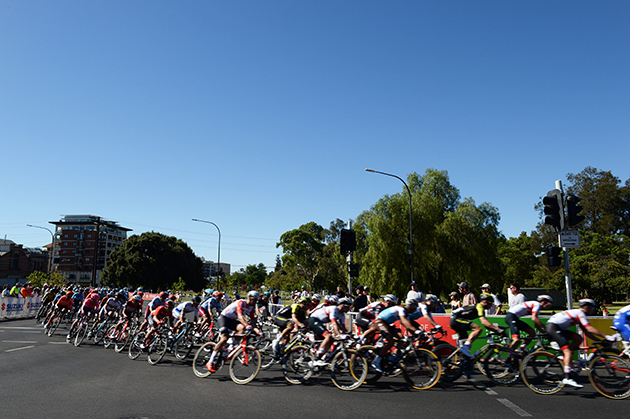 45 HAMILTON, Lucas (Mitchelton-SCOTT) s.t. 46 PETERS, Nans (Ag2R La Mondiale) s.t. 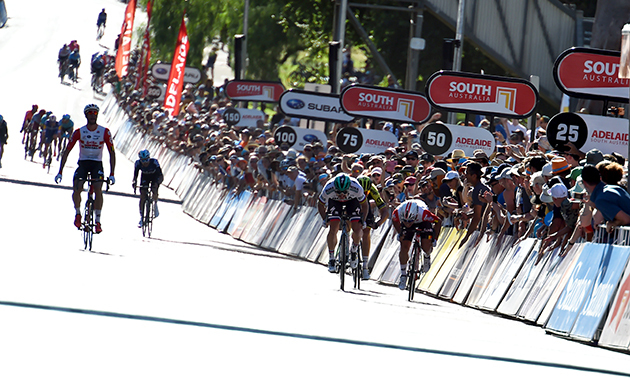 47 IMPEY, Daryl (Mitchelton-SCOTT) s.t. 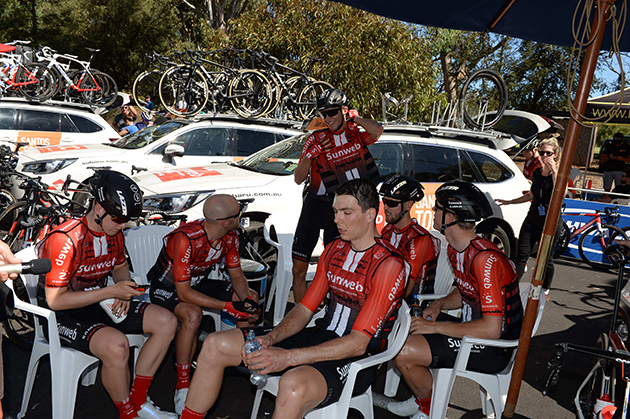 48 HINDLEY, Jai (Team Sunweb) s.t. 49 SUNDERLAND, Dylan (UniSA-Australia) s.t. 50 BOL, Cees (Team Sunweb) s.t. 51 MARECZKO, Jakub (CCC Team) s.t. 52 CAVAGNA, Remi (Deceuninck-Quick-Step) s.t. 53 GESINK, Robert (Team Jumbo Visma) s.t. 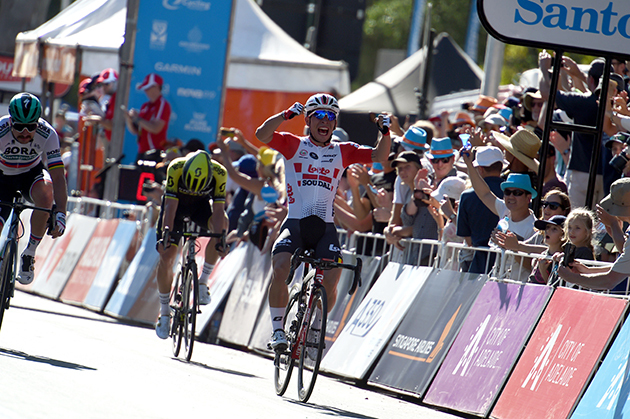 54 HEPBURN, Michael (Mitchelton-SCOTT) s.t. 55 DLAMINI, Nicholas (Dimension Data) s.t. 56 BODNAR, Maciej (BORA-hansgrohe) s.t. 58 POTTER, Michael (UniSA-Australia) s.t. 59 CARRETERO, Hector (Movistar Team) s.t. 61 DENZ, Nico (Ag2R La Mondiale) s.t. 62 FRANKINY, Kilian (Equipe Groupama-FDJ) s.t. 64 PÖSTLBERGER, Lukas (BORA-hansgrohe) s.t. 65 MÜHLBERGER, Gregor (BORA-hansgrohe) s.t. 66 SAJNOK, Michael (CCC Team) s.t. 67 GATTO, Oscar (BORA-hansgrohe) s.t. 68 VINCENT, Leo (Equipe Groupama-FDJ) s.t. 70 MARCZYNSKI, Tomasz (Lotto Soudal) s.t. 72 CASTRILLO, Jaime (Movistar Team) s.t. 73 MORABITO, Steve (Equipe Groupama-FDJ) s.t. 74 DEBUSSCHERE, Jens (Team Katusha Alpecin) s.t. 75 DOWSETT, Alex (Team Katusha Alpecin) s.t. 76 GIDICH, Yevgeniy (Astana Pro Team) s.t. 78 MORTON, Lachlan (EF Education First) s.t. 79 FOMINYKH, Daniil (Astana Pro Team) s.t. 80 KUZNETSOV, Viacheslav (Team Katusha Alpecin) s.t. 81 STRAKHOV, Dmitry (Team Katusha Alpecin) s.t. 82 POELS, Wouter (Team Sky) s.t. 83 PANTANO, Jarlinson (Trek-Segafredo) s.t. 84 ELISSONDE, Kenny (Team Sky) s.t. 85 SÜTTERLIN, Jasha (Movistar Team) s.t. 86 SUTHERLAND, Rory (UAE Team Emirates) s.t. 87 BYSTROM, Sven Erik (UAE Team Emirates) s.t. 89 HOFSTEDE, Lennard (Team Jumbo Visma) s.t. 90 LINDEMAN, Bert Jan (Team Jumbo Visma) s.t. 92 KNEES, Christian (Team Sky) s.t. 93 SCULLY, Thomas (EF Education First) s.t. 94 BAUHAUS, Phil (Bahrain Merida) s.t. 96 BEVIN, Patrick (CCC Team) s.t. 97 ROSSKOPF, Joseph (CCC Team) s.t. 98 SCOTSON, Miles (Equipe Groupama-FDJ) s.t. 99 CLARKE, William (Trek – Segafredo) s.t. 100 BENNETT, George (Team Jumbo Visma) s.t. 101 LADAGNOUS, Matthieu (Equipe Groupama-FDJ) s.t. 102 LATOUR, Pierre (Ag2R La Mondiale) s.t. 104 POZZOVIVO, Domenico (Bahrain Merida) s.t. 108 GIBBONS, Ryan (Dimension Data) s.t. 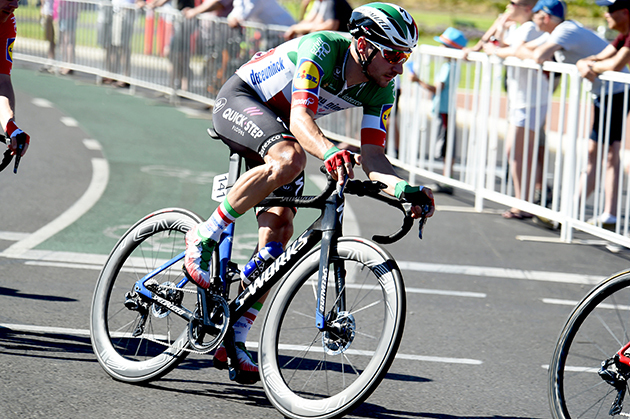 109 O'CONNOR, Ben (Dimension Data) s.t. 112 SLAGTER, Tom-Jelte (Dimension Data) s.t. 113 TOOVEY, Ayden (UniSA-Australia) s.t. 114 HARPER, Chris (UniSA-Australia) s.t. 115 HAYMAN, Mathew (Mitchelton-SCOTT) s.t. 116 WYNANTS, Maarten (Team Jumbo Visma) s.t. 118 DENNIS, Rohan (Bahrain Merida) s.t. 121 VIVIANI, Elia (Deceuninck-Quick-Step) s.t. The pack gets strung out. 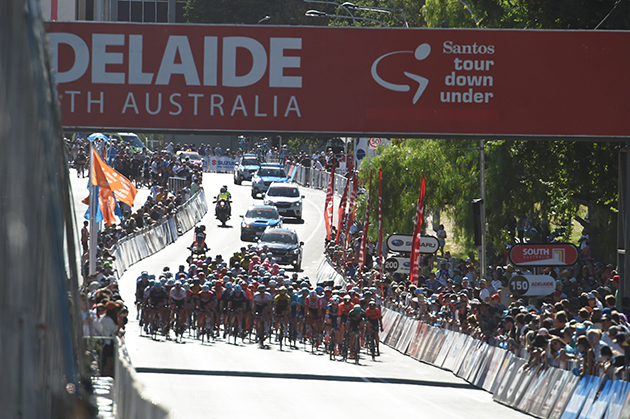 Caleb Ewan gets the jump on Peter Sagan in the sprint. 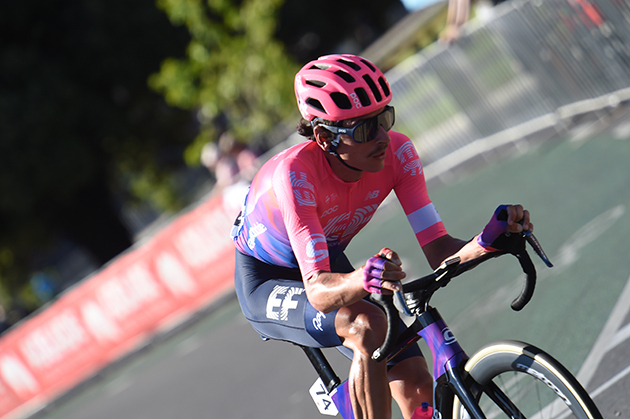 The race belongs to Caleb Ewan.